My Uncle bought me the biggest teddy he could find! When I saw the size of the teddy bear uncle “EBee” had bought Oliver it made me smile. When I received this photograph it made me laugh out loud. It is by far the largest and softest of ALL the wonderful “cuddly” toys he received. I am happy to report baby Oliver is now home and doing well. Every day he grows stronger, shouts louder and makes his little presence felt in a big way. I will miss him so much when we return to Portugal. Thanks to everyone for their kind words on my earlier post Proud Grandparents “take” Two… either in comments or sent by email. Thanks Mumsy…I think the bear really puts the size of little Oliver in perspective. I am going to frame this photograph! Thats the biggest i have ever seen, he will have fun trying to hold it. Sit on it more like! Wow! Good thing it’s not an Alaskan grizzly! Thanks for the good news and update on grandbaby Piglet, and for that risque title, you naughty woman. Cyber hugs from across the pond at Oliver’s health! Hi Jan the title was a bit risque…bet people wondered what on earth the post was about! Gorgeous photo! Congratuations to all the family. Oliver (and the bear) are adorable! Aww, how sweet. 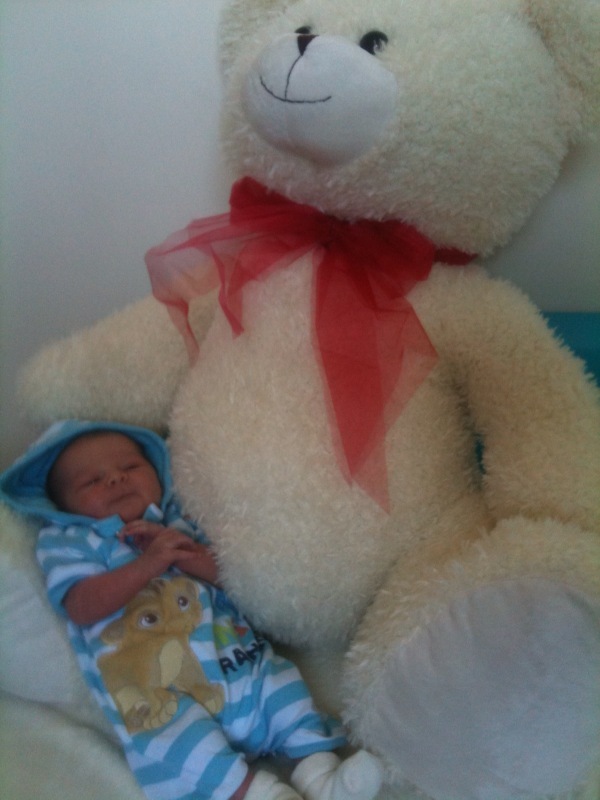 Either Oliver is very tiny or that Teddy is really huge! Congratulations to you and your family on this sweet new little edition to the family who’s already bringing you so much joy. Oh, my gosh. This photo is just tooooo cute. What a darling grandbaby! How beautiful.. congrats to you & your family!! Never seen such a huge teddy. Glad Oliver is doing well and will eventually grow as tall as his teddy. Oliver is seriously handsome. Love the photo. ¡Que precioso, PiP! Thanks for sharing. Great photo of the new little one and the new big one! WOW! They’ll need a bigger house just for the bear! ACK! too cute! Congrats on your family! So cute !!! I’ve always wanted to have one like this too ! 🙂 Baby Oliver really looks adorable in this photo. Enjoy all the time you spend with your family ! I’m so glad he’s doing well now and is home where he should be. Pretty soon he`ll be the size of the bear….. Glad all is well! Hi PiP! Belated Congrats on Grandbaby Nº 2!! Glad to hear he’s home and doing well and can certainly commiserate on long-distance grandparenthood!